This blog most frequently concentrates on subjects that directly link the eye and the brain. However, head and facial trauma can involve direct injury to the eye. Automobile accidents can cause direct trauma to the face. In particular, airbag deployment can prevent fatal brain injury but often cause eye injuries. This has been documented in a previous blog exploring the issues of airbags. Unfortunately, when you have a device that prevents the energy of a steering wheel from striking the head (the airbag), the force tends to be distributed to other adjacent organs (the eye). Direct blunt trauma to the eye can cause bleeding in the front of the eye (the medical term: hyphema). This is sometimes diagnosed in the emergency room. Large amounts of bleeding can cause immediate and serious threats to vision. Small amounts of bleeding are more common, usually resolve and the blood gets re-absorbed. These angle structures can be examined by use of special mirrored examining instruments used routinely by an ophthalmologist. These angle structures are commonly damaged or pushed back after injury, especially when there was initial bleeding. Thus the term “angle recession.” This is an important diagnosis to make and can only be made by an optometrist or ophthalmologist. As described above, the angle anatomy serves as a filter for eye fluid. If this anatomy is damaged, this can lead to a long-term risk for development of glaucoma, a serious disease of the eye where the eye pressure is elevated. The fluid is partially blocked from exit. This risk remains throughout a patient’s life. Glaucoma is generally a silent disease causing no pain or central vision loss until it is too late. If caught early, it can usually be treated. However, once angle recession is identified (even in a teenage auto accident victim), the angle can never heal and the risk remains. Science investigations vary on estimates of risk, but significant recession probably carries about a 20% risk for glaucoma. In my 30+ years of clinical practice, I have seen many cases of angle recession glaucoma. An early eye exam after trauma is critical in identifying those at risk for this type of glaucoma. 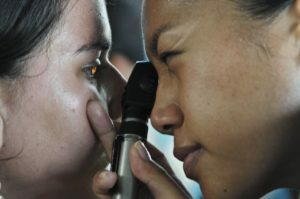 These patients will need to be screened for glaucoma more frequently the remainder of their lives. Patients also have a right to know future risks even if the eye appears to return to normal. As stated, this is not any easy diagnosis to make. Angle recession is usually missed and remains hidden until it’s too late. Airbags are a common initial event. The initial trauma to the eye can appear minor and signs and symptoms frequently disappear. Glaucoma can damage the optic nerve and lead to blindness, but the damage can occur slowly. Angle recession is one more red flag in the world of head and facial trauma.